The Make Sale/Post Fees button is located on every Family page. Click the Make Sale/Post Fees button to open the Make Sale/Post Fees page. In the Family Details section, change the Transaction Date if applicable. In the Select Items section, select items from the Store if applicable (See the Store / Point of Sale section). Update the Qty. 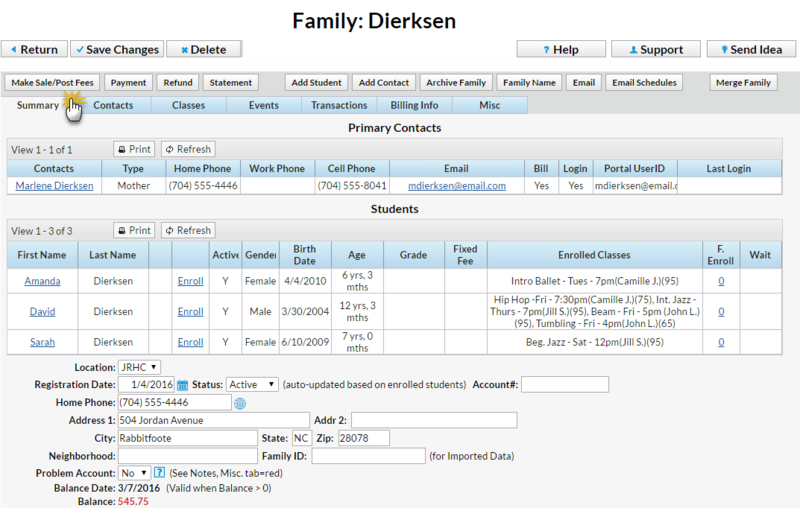 Optionally, add a Student, Class/Event, and Note. After adding one item fee, another item fee line will display. You can add an unlimited number of items fees. 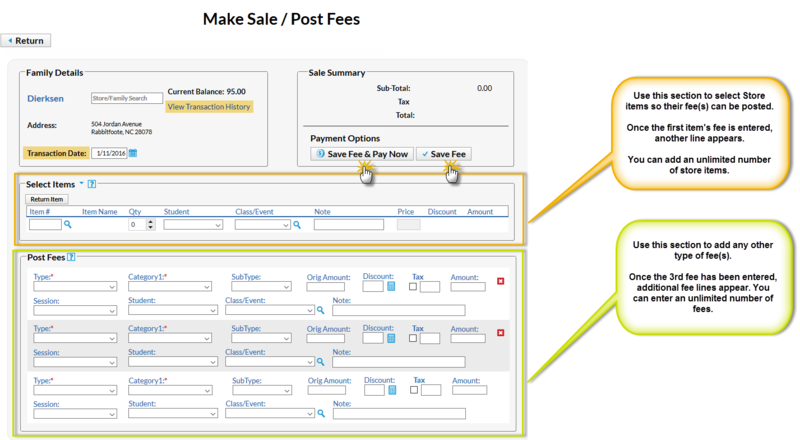 In the Post Fees section, choose a (Transaction) Type from the drop down list. Choose a Category1 from the drop down list. Note that Category 1 is required if you have Tools > Edit Settings > Require Cat1 = Yes. Jackrabbit always recommends you include a Category 1. Choose a SubType from the drop down list (optional). If applicable click the Calculator icon to enter a discount. Choose a Session from the drop down list (optional, but highly recommended). Choose a Student from the drop down list (optional). If the fee is tuition related, select a Class/Event from the drop down or click the Magnifying Glass (Search) icon to select a Class/Event. If you add a class to this field, notice that the Category1 field adopts the Category1 assigned to that class. This is a safeguard to ensure the correct Category1 is used for the class tuition. Continue adding more fees if needed. You can add an unlimited number of fees. Additional fee lines will display after the third fee is added. When you've finished adding fees, click either the Save Fee & Pay Now button to save the fees and open a Payment screen or the Save Fee button to save the fees without posting a payment at that time.